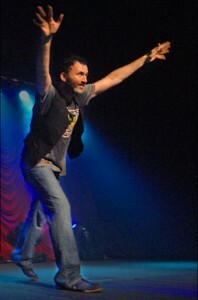 One of Ireland’s funniest, most recognizable and most controversial comedians has arrived to take on a string of dates at Vicar Street – yes, Mr. Tommy Tiernan has returned to Dublin, with his Crooked Man tour. This is Tiernan’s first nationwide tour since he got married, and also the first tour since the ‘Holocaust’ controversy regarding comments he made during an interview at Electric Picnic (which was, frankly, totally blown out of proportion). So, with the watchdogs leering at him, would Tommy bow to the pressure and water down the show to a more politically correct affair? Thankfully, the resounding answer is no. Crooked Man follows in the same vein of Tiernan’s previous hit shows Loose, Cracked and Bovinity in that no group in society is safe. This time around, we hear stories of Travellers, Liverpudlians and, perhaps most controversially, Catholic priests- but it’s all in the name of comedy. Tiernan does seem to have gotten a bit madder in recent times, with quite a crazy start to the show featuring him bouncing between the darkness and a thin ray of light (or ‘rationality’). When he proceeds to tell us he would rather play a silent fiddle and hope that we all can hear it than be rational, the audience knows we’re in for a bit of a bonkers experience for the next hour or so. Highlights of the show include an impression of Jeremy Kyle, a story about Tiernan taking his daughter to a Liverpool match, and a very graphic description of contraceptive devices. Tiernan’s show is not for those that are easily offended, but the man often named Ireland’s best comedian is a joy to watch and should hold onto his crown for a good while yet. Support came from the superb Mayo-man Gerry Mallon, who will definitely gain a new fan base through this gig with Tommy. You can catch Tommy playing various dates in Vicar Street between the 6th and 22nd of January, with tickets priced at €35. This is one show not to be missed!